While there are stray bits of stuff hitting Earth from all directions, there also are regularly timed "meteor showers" when astronomers can make better predictions about how many meteors will hit the Earth, and from what direction. The key difference is that meteor showers occur when the Earth plows into the trail of particles left behind by a comet or asteroid. Depending on where the trail of particles falls in a particular year, meteor showers can be more or less intense. Most meteors become visible at around 60 miles (96.5 kilometers) up. Some large meteors splatter, causing a brighter flash called a fireball, which can often be seen during the day and heard up to 30 miles (48 km) away. On average, meteors can speed through the atmosphere at about 30,000 mph (48,280 kph) and reach temperatures of about 3,000 degrees Fahrenheit (1,648 degrees Celsius). Most meteors are very small, some as tiny as a grain of sand, so they disintegrate in the air. Larger ones that reach the Earth's surface are called meteorites and are rare. Whether an object breaks apart depends on its composition, speed and angle of entry. A faster meteor at an oblique angle (slanting rather than straight-on) suffers greater stress. Meteors made of iron withstand the stress better than those of stone. Even an iron meteor will usually break up as the atmosphere becomes denser, around 5 to 7 miles up. When meteorites do hit the ground, their speed is roughly half what it was upon entry, and they blast out craters 12 to 20 times their size. Craters on Earth form much as they would on the moon or any rocky planet. Smaller objects create bowl-shaped craters. Larger impacts cause a rebound that creates a central peak; slipping along the rim forms terraces. The largest impacts form basins in which multiple rebounds form several inner peaks. Large meteors can explode above the surface, causing widespread damage from the blast and ensuing fire. This happened in 1908 over Siberia, in what's called the Tunguska event. On June 30, 1908, across hundreds of miles, witnesses saw a ball of fire streak through the sky, suggesting the meteor entered the atmosphere at an oblique angle. It exploded, sending out hot winds and loud noises and shook the ground enough to break windows in nearby villages. Small particles blown into the atmosphere lit the night sky for several days. No meteorite was ever found, and for years many scientists thought the devastation was caused by a comet. Now, the prevailing theory holds that a meteor exploded just above the surface. A similar event occurred over Chelyabinsk, Russia, when a 17-meter rock exploded 12 to 15 miles above the Earth's surface on Feb. 15, 2013, damaging buildings and injuring more than 1,000 people. According to a statement by Peter Brown of the University of Western Ontario in Canada, "The energy of the resulting explosion exceeded 470 kilotons of TNT" — 30 to 40 times more powerful than the atomic bomb dropped on the Japanese city of Hiroshima during World War II. Although the Russian event brought into focus the possible danger Earth could suffer from space rocks, most meteors don't cause nearly as much damage. Still, NASA and other entities keep careful track of all asteroids visible from Earth, and are actively engaged in discovering as many asteroids as possible — especially the ones that are larger and would pose more of a (theoretical) threat to Earth. Asteroid orbits are plotted and tracked to see if they will intersect with Earth in the future. While no imminently threatening object has been found, NASA continues the search and posts the results publicly on the Small Body Database Browser. In ancient times, objects in the night sky conjured superstition and were associated with gods and religion. But misunderstandings about meteors lasted longer than they did about most other celestial objects. Meteorites (the pieces that make it to Earth) were long ago thought to be cast down as gifts from angels. Others thought the gods were displaying their anger. As late as the 17th century, many believed they fell from thunderstorms (they were nicknamed "thunderstones"). Many scientists were skeptical that stones could fall from the clouds or the heavens, and often they simply didn't believe the accounts of people who claimed to have seen such things. The largest meteorite recovered in the United States fell in a wheat field in southern Nebraska in 1948. Witnesses saw a giant fireball in the afternoon that some said was brighter than the sun. The meteorite was found buried 10 feet deep in the ground. It weighed 2,360 pounds. The most famous meteorite crater in the United States is misnamed Meteor Crater. It's in Arizona, and it's huge. The rim rises 150 feet from the surrounding plain, and the hole is 600 feet deep and nearly a mile wide. It was the first crater that was proven to be caused by a meteorite impact, which occurred between 20,000 and 50,000 years ago. Meteors are often seen falling from the sky alone — one here, one there. But there are certain times in a year when dozens or even hundreds of meteors per hour will light up the sky, seemingly coming from one part of the sky, radiating in all directions, and falling toward Earth one after the other. There are several periodic meteor showers that astronomers and amateur observers wait for every year. Meteor showers are named after the constellations from where the shower appears to be coming from. For example, the Orionids appear to originate from the mighty Orion constellation, while Perseid meteors seem to be coming from the Perseus constellation. Perseids: Another shower that is worth keeping awake for is the Perseid meteor shower, which is associated with the comet Swift-Tuttle, which takes 133 years to orbit the sun. Earth passes through the comet's orbit during the month of August every year. It is not as active as the Leonids, but it is the most widely watched meteor shower of the year, peaking on Aug. 12 with more than 60 meteors per minute. Richard Hay sends this image of a Quadrantid meteor and says: "My wife and I ventured out into the frigid 26-degree Florida night this morning to catch the shower with our own eyes, and [were] rewarded with about 20 or so bright Quadrantids over a 90 minute period." Geminids: Like the Quadrantids, the Geminid meteor shower also came from dust particles of an asteroid, this time a near-earth asteroid called 3200 Phaeton. Meteor showers are mostly from comets, so having an asteroid as parents make the Quadrantids and Geminids different from other meteor showers. The Geminids happen in December and spray up to 40 meteors per hour out of the Gemini constellation at its peak. Other meteor showers to watch out for are the Eta Aquarids, also remnants of Halley's comet, in May; and the Lyrids, which have been chronicled for more than 2,000 years, in late April. People living in the Northern Hemisphere are in the best position to observe the most beautiful meteor showers. For example, North America is right below the region of the sky where the January Quadrantids shower appears. A bright moon can dim the prospect of seeing a good meteor shower, drowning out all but the brightest meteors. Local light pollution dampens prospects, too, so the best place to view a meteor shower is from out in a rural location. Most meteor showers are best viewed in the pre-dawn hours, when the part of Earth you are standing on is facing the direction of Earth's orbit. It's like bugs hitting a car's windshield. In the late evening hours, on the other hand, the meteors are less frequent — loosely akin to bugs hitting a car's rear bumper. 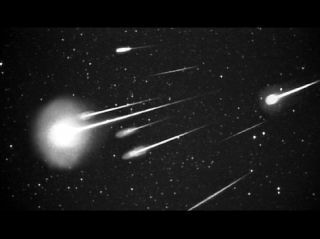 Meteor showers can be seen at different times of the year depending on when Earth is going to pass through the comet's or asteroid's path. Some meteor showers happen annually; others only appear over a period of several years, while some of the best shows — meteor storms — happen just once or twice in a lifetime. Weather can also hamper a good view of meteor showers. A clear sky is a gift to night gazers, which is why meteor showers during the summer are more anticipated than those that fall in the winter months.